The chubby Sammo Hung Kam-Bo co-directed and co-starred as the intellectually impaired Dodo in this Hong Kong martial arts film with heart from the mid 1980s. Jackie Chan is Ted/Tat Fung, a SWAT-type squad member who is recruited into the Hong Kong police department to fight a big crime boss. His dream is to sail the world, but he’s been caring for his brother since they were orphaned. He comes close to realising his dream by organising a commercial ship to sail on and finds care for his brother with some neighbours. In his quest for freedom and fulfilment of ambition, he gets so carried away, he does not see that his brother cannot take care of himself. Dodo plays with the neighbourhood boys, whose intellectual age approximates his. They sometimes take advantage of him—like in the restaurant scene, or when one kid gets him to pretend to be his father and to parrot out the same response to the concerned teacher. At play, he stumbles onto a big-time jewellery heist and gets chased by the baddies. His brother Tat is the good guy charged with finding the baddies! The playful, endearing script shines through. None of the performances is over-wrought, nor is there any sugary sickliness about the emotions the characters have. There is a surprising honesty and realism to the reality of living with and caring for someone with a disability. 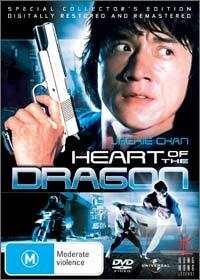 It is a film from the pre-PC era and from an Asian country so there is no euphe-mystication, thank goodness! The articulate grasp of empathy is my favourite aspect of Heart of the Dragon. But that’s getting way too ‘deep and meaningful’! Let’s not forget what this film and its genre are. There’s plenty of funky kung fu moves and shooting, enough cheesy dialogue to make a risotto. So all up it’s an enjoyable film with a very appropriate title! I enjoyed it even though this kind of movie isn’t normally my thing.